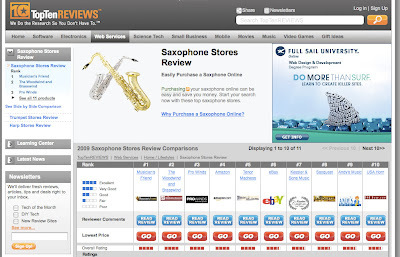 Over the past few weeks I have been working steadily on completing my first online review, "How-To Purchase a Saxophone Online" for TopTenREVIEWS. I reviewed the top 11 companies that sell saxophones online and wrote a review for each. I researched every category a prospective buyer may be interested in an online saxophone store and made a "matrix" to compare each store. Anyway, this is the reason I have had to neglect my first love, The How-To Gal, so check it out! Now that I have this under my belt, I should be back soon with some fun and crafty tutorials! This is crackin' me up. I follow your blog and just happen to be a private teacher of saxophone:-) How stinkin' wierd is that?? ?